The succulent texture and nut-like appearance of the Graber Olive is difficult to describe in words alone! This rare combination of delicious flavor and succulence keeps family and guests asking for more! 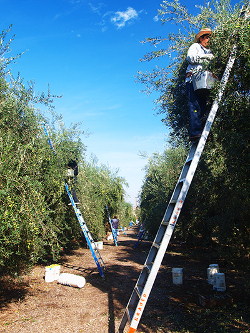 Graber Olives are allowed to mature on the trees to a cherry-red color which denotes tree-ripeness. Olive No. 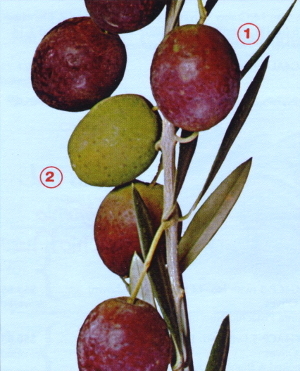 1 and similar olives on the branch at left are selected by the pickers for the Graber process. The cherry-red colored and tender tree-ripened Graber Olives are carefully hand picked and cured in covered vats without being oxidized. 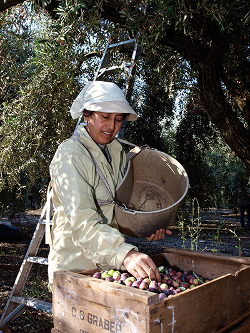 After the curing and canning processes, the olives are of varying shades of nut-like color. 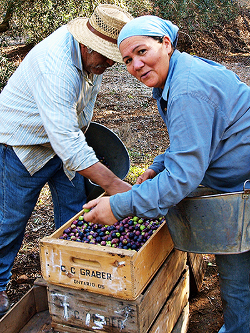 With the Graber process, the natural full flavor and succulence of the tree-ripened olives has been preserved. A rare delicacy has been created!